Home Fashion Get Creative with Your Two Color (aka Double Color) Sarees! 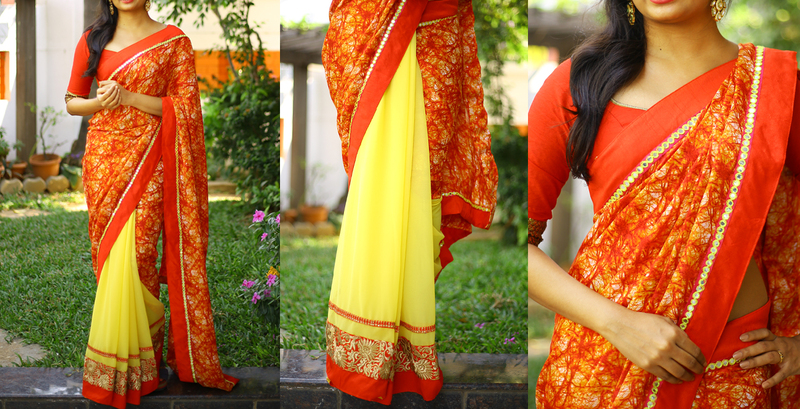 Get Creative with Your Two Color (aka Double Color) Sarees! Do you know what is the one thing that you have been doing while saree shopping without even realizing? 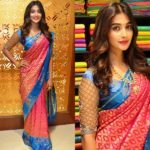 Yes, if you are intense saree shopper like us, chances are you would have already been owing lots of two color combination sarees without even knowing that you are rooting for it. Two colors aka double color sarees stands for myriad mix of two fanciful hues on the 9 yards of clothing. 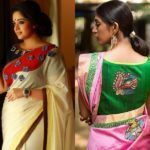 If you go for any shop and place your hands on the best looking saree that first hits your sight, chances are it is the cool look derived from two alluring color plays in the sarees. Of course, many finish off the saree shopping without even understanding why they choose the particular saree at all. The answer is the colors! That’s why next time, when you head for shopping, if you keep yourself updated on all the possible color trends on sarees, you will be more at ease to find the best saree! How to Choose Best Two Color Sarees? In this classic saree style, the primary hue remains as the base and the second hue is infused to highlight the details of the saree. When we say details, it could be the border work, prints, patters and other interesting elements made on the saree to make it more fashion forward. If such interesting details are etched on the saree on a contrasting color to the base, you will find your saree taking up an entire new dimension. So when you shop two color sarees, look whether the colors are playing well on the following zones. If you get this right, chances are your saree style is more memorable when you actually drape it. To explain the concept we dug deep into reputable saree brand and find huge collections from the label ‘Zari’ by Anju Shankar. You can shop their collections at the end of this post. Now let get’s started. Piping is not just for your blouse neck and sleeves. It can add fine element of highlight when done on saree borders too. Your bored looking sarees can be instantly perked up by the addition of super contrast piping work on the saree. One great place to include bright hues to your sarees without looking gaudy is to have fun in the border area. Light colored sarees with a peppy border is the trending design of this season. Imagine wearing an ivory saree with maroon border, or orange saree with fuchsia pink. Sounds fabulous right? Wearing fuchsia or deep maroon as a standalone colors might be hard to pull off in sarees, however when they are mixed with other subtler tones that gel well with it, the rest is history. Another fine way to shop best looking dual shade sarees is to look for the exciting prints that can totally steal the show. Imaging a half-and-half party wear saree, with a deep hue in the bodice, and a fun floral printed bottom to balance out each other. Oh! We are sure it will be such a cool saree look for any event. If you want your double shade sarees to be totally catching all the attention, do consider to experiment with different fabric. For instance net and velvet fabric can be great materials to come up with alluring saree designs. Beige or ivory net fabric for the base and deep emeralds and burgundy as contrasting colors to play out the details is one nice way to make the color combinations work out. Another easy and most tried out way with two color saree is to stick to a basic color for the saree and made it to look million bucks by teaming it up with a nice contrasting blouse. From boat necks to super chic designer blouses, you can win this trend by picking up the right color blouse for your sarees. 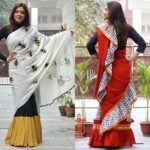 Half and Half sarees are another hot selling model of this season with everybody attesting to the fact it will be even more popular in the coming days. These sarees make a great party wear. So if you want a colorful saree that should also double up as party wear, do invest on this one. Today saree trend is all about innovative patch work, sophisticated thread detailing and much more. If you opt for such eye catching work on right colors, it will make world of difference to your saree ensemble. If you don’t want your saree to be loud and bold with all the vibrant colors, consider picking sarees with one base color and all its detailing worked out in subtle different shade of the same color. For instance deep emerald green and parrot green can be a fantastic combination and so is baby pink and fuchsia pink. Here below is peach and orange making a vibrant mix to steal the attention! These are some of the areas where you need to focus if you like to shop a best vibrant looking sarees for yourself. Now, let’s see some of the popular trending colors that you need to keep an eye when you shop for this sarees. Pink and orange are great combination to try out this season. This makes a best color to try out on party wear. Vibrant orange on fushica is going to be spectacle to drape. However if you are color conscious, you need to select mellowed orange and pink for you. Pastel yellow with bright pink can be great one to try if you plan to attend day time events. All college goers, here you have your best farewell saree hue awaiting! Royal blue and mustard yellow is a winning combination to try with your traditional silk sarees. Even plain georgette/chiffon sarees with these two shades make a wonderful choice for any event and parties. White is a welcoming color when it comes to accommodating other shades! While every other color is fun to wear with white, a dashing pink always comes up with an arresting look. Sea blue and parrot green might sound less exciting in paper, however, when you try it on a person, the magic is highly evident. Okay, we saw the list of elements you need to keep an eye when you opt for dual color sarees. We have also checked out some trending colors of this season. Now time to seek real inspiration! Yes whatever we have been telling you to try might get lost in the world of doubts without us showing you the real inspiration as last resort. Ahead you will find all the leading celebrities giving a fashionable spin to this two color sarees. Scroll ahead and seek the much need inspiration now! 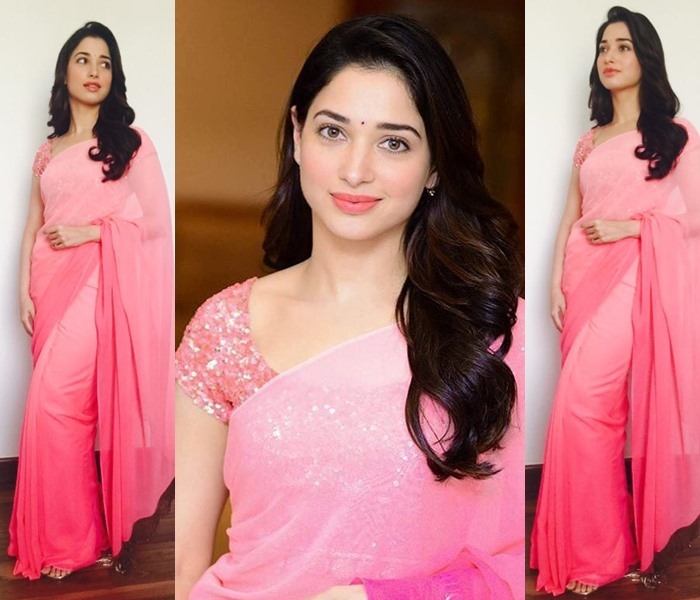 Here is Tamanna being uber cool with a dual shade plain saree. 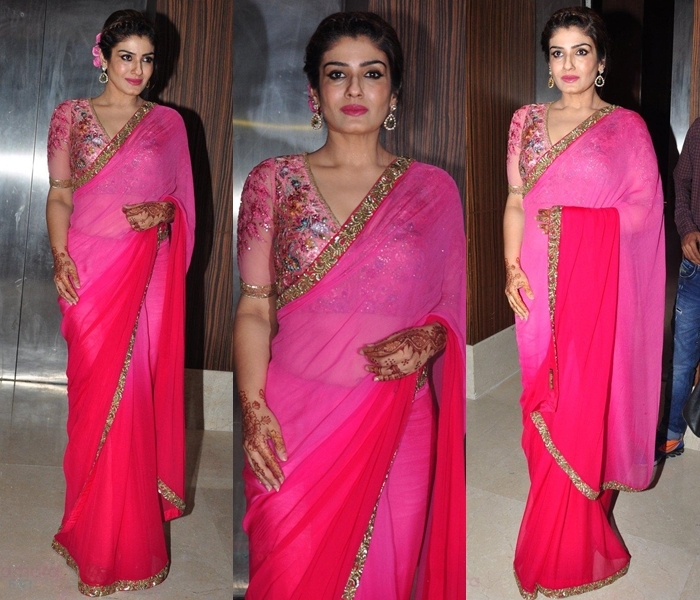 All she needed was two mesmerizing tones of pink and a sequin blouse to nail this saree look. Next is Raveena Tandon, pretty much following the same trend that Tamanna sported earlier. This classy lady has opted for embellished net blouse to make this bright saree look so polished and colorful! Next we have Shreemukhi having fun with a plain yellow and white saree. 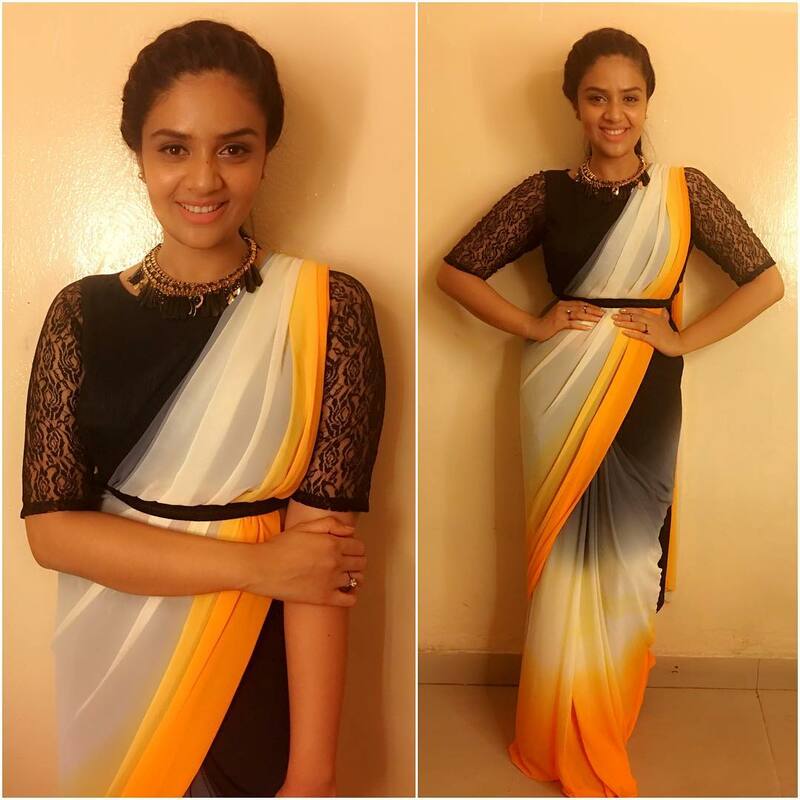 She elevated this saree style by a chic belt and a lace blouse in black. It is a handloom saree for Neha Dupia to experiment this trend. The white and grey saree is nourished with fine silver accessories. We are seriously lusting over this look. And here we have the glam doll Mandra bedi wearing a yellow and teal filled simple saree which she paired with ultra fancy blouse. We love the glittery details on pallu! 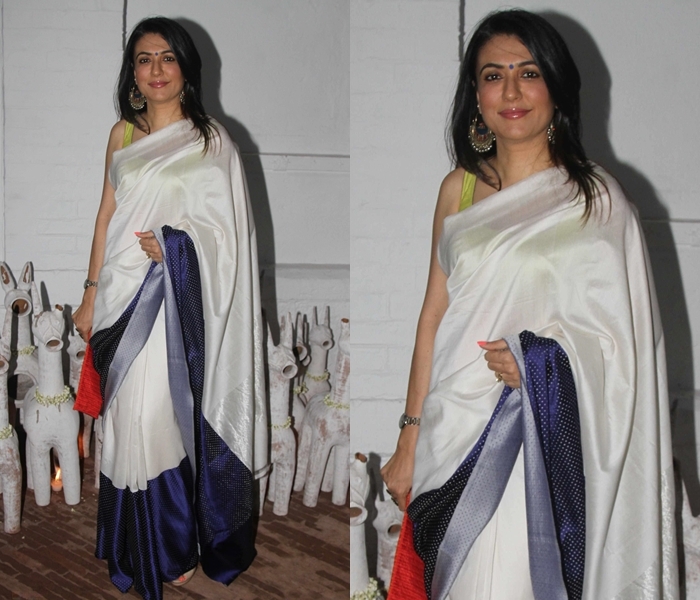 This is Mini Mathur redefining grace and elegance with her simple silk saree in the tones of white and navy blue! Pairing them with yellow blouse might be a surprise for everyone, but it worked as a wonder here. So dear ladies, we hope you saw that two prominent shades can make your sarees look more fanciful and attractive. Though it is good to pick the first choice that hits your eyes while shopping, understanding more about these two color sarees and how it can be styled properly can help you make better choices. Do try out these sarees and let us know how you styled it! 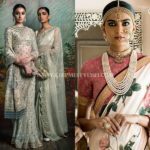 7 Indian Fashion Designer Sarees You Can’t Afford to Miss! 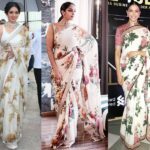 Why You Should Own A Floral Saree Right Now?